Trimming The Fat In Japan. To do their part in combating the worlds horrendous obesity epidemic, Japan has said N.I.M.B.Y. to that mess. By applying rules and regulations that essentially make ‘being fat’ illegal, they are making sure obesity never happens to them. 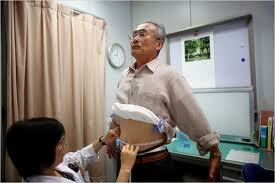 Waist measurements for those aged 40 and above are set at 33.5 for men and 35.4 for women. The people of Japan are tested annually by their employer to be sure their weight has not gone off the deep end and if it has, then the employee must go to counseling to find the root issue. One simply ‘getting fat’, is simply not acceptable. 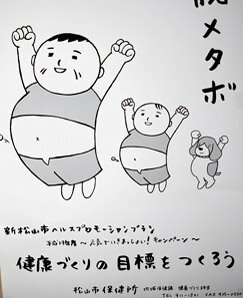 By this year, 2012, Japanese employers were told they needed to slash their overweight employees by 10% and by 2015 it needs to be at 25%. Named the ‘Metabo Law’, this is Japan’s way of keeping themselves in check. With a obesity rate that is less than 5%, many may think this law is nuts. But when you look at the changes in the Japanese diet and where they are coming from (America), then look at that land’s obesity rate (America, almost 40%), you see how that dietary disaster destroyed them. Anyone with 2 eyes and common sense would not want to emulate America on this topic. A lot of this comes down to Japan’s style of heath care and let’s face it, being overweight is a huge burden on the healthcare system. Japan knows this and that is why their health exams also include questions about smoking, blood pressure, cholesterol and blood sugar tests. Sure this may seem radical and insane to some but look at us here in the US, there are more overweight and obese people than there are slim or average. And it happened quick. Categories Fit Tips., Nutrition., People, Places And Things. ← Restaurant Review: Strong Hearts Cafe.